In a small skillet, heat oil over medium. Add shallots and cook until softened, about 4 to 5 minutes. Remove and set aside. Carefully slice tenderloin lengthwise, cutting to, but not through, the other side. Open pork halves like a book, making the tenderloin lay flat. Pound pork to an even 1/2" thickness. 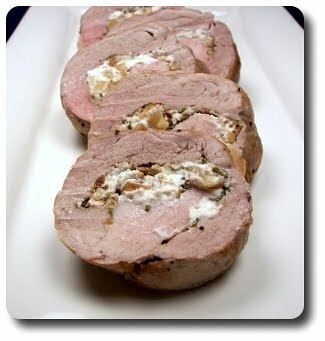 Season pork with salt and fresh ground black pepper - scatter cooled shallots, cheese, walnuts and thyme over the top. Roll meat up, starting with long side - secure pork at 1" intervals with kitchen twine. Season outside with salt and fresh ground black pepper. Place pork onto the grill and cook, turning after 11 minutes, until a thermometer registers 145 degrees, about 20 to 25 minutes. Remove from the grill and place on a cutting board - cover with foil and allow to stand for 10 minutes before slicing to serve. Meg - Nothing to be scared or nervous about! You should try it if you eat meaty proteins.